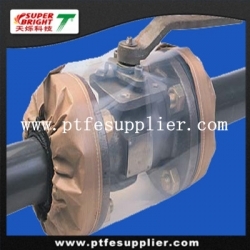 Our PTFE Flange Spray Shields is made from selected fiberglass then coating PTFE, combine the easy release and heat resistance of PTFE and the strength and dimensional stability of the fiberglass. High-pressure resistance, operating temperature from-60℃ to 260℃. Reusable and outlast for longer time compared with other material products. Material: Fiberglass and PTFE resin. Valve Shield contains a drawstring for securing, absolutely sealed. Available for all brands and styles of valve, available for any size and length, angle or straight cut. Simple and easy to install by only one person without any auxiliary tools. It is used to cover the Valve on safety relief valves and rupture discs, prevent the harm of splash or, spitting and leakage of the high temperature, high pressure, strong acid, strong alkali, or other hurtful liquid and fire, avoid industrial injuries caused by them.. Even keeps out birds and insects, safe for personnel, equipment and the environment.